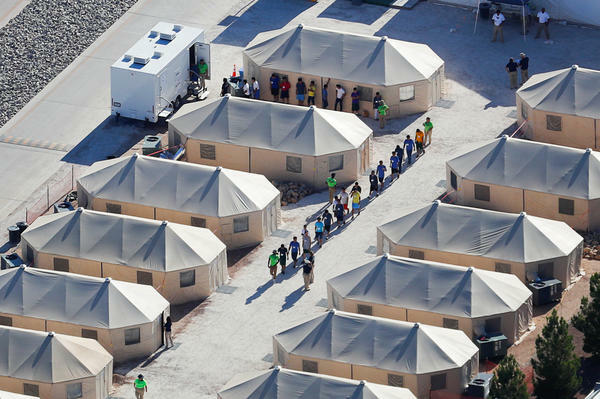 Migrant children now housed in a tent encampment under the Trump administration's "zero tolerance" policy are shown walking in single file at the facility near the Mexican border in Tornillo, Texas, on June 19. 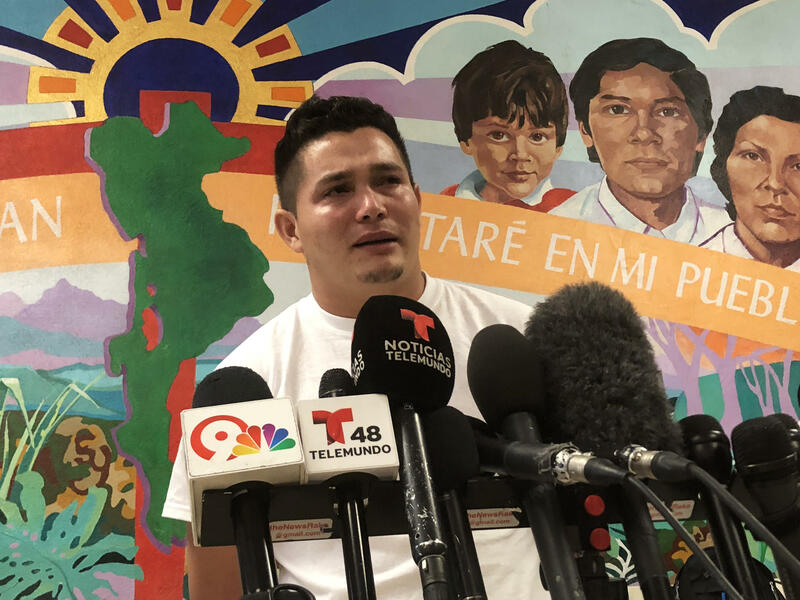 Mario told journalists in El Paso, Texas, that he has been unable to talk to his daughter since they were detained separately a month ago by Immigration and Customs Enforcement. 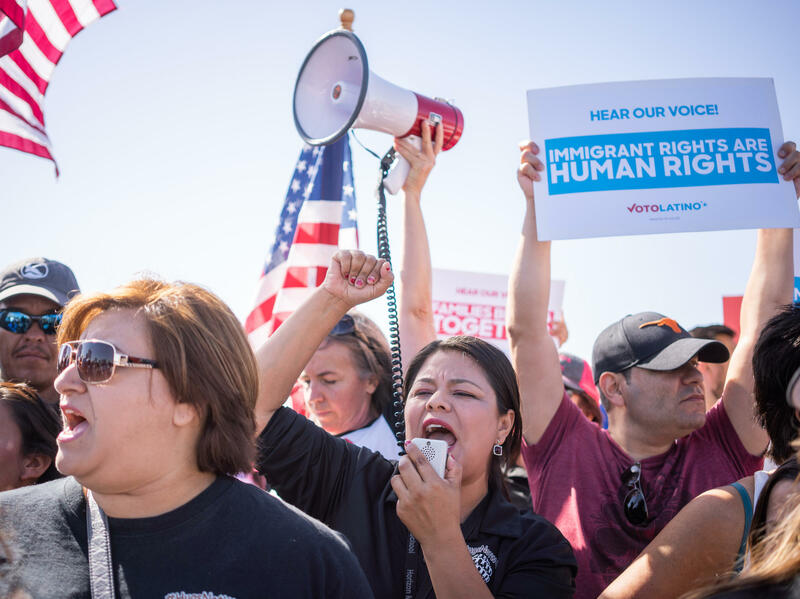 Activists chant at an "End Family Detention," event at the Tornillo Port of Entry on Sunday. A Honduran father caught crossing the border illegally with his daughter was released from custody with an ankle monitor in El Paso, Texas, on Monday — the same day his daughter turned 10 years old in a government-run shelter. The father and daughter have been separated for the month he was in Immigration and Customs Enforcement detention, and she was in a shelter run by the Department of Health and Human Services. He said he called a 1-800 number that HHS set up to get an update on his daughter. "It rang and rang with no answer," Mario said on Monday. The distraught father asked to be identified by only his first name because he feared that speaking out could hurt his asylum claim. "I'm crushed," he continued. "I don't know anything about her. Today she's 10 years old, and I can't call her and tell her how much I love her." The Trump administration's "zero tolerance" initiative against illegal border crossings — which led to families being separated at the U.S.-Mexico border — has effectively ended, at least for now. Customs and Border Protection said on Monday that it will stop referring every person caught crossing the border for criminal prosecution. "A much better system would be to keep families together through their immigration proceedings," CBP Commissioner Kevin McAleenan told reporters Monday in McAllen, Texas. "That's what Obama did in 2014, and that's what the president has asked the Congress to help us do now." CBP's announcement comes less than a week after President Trump signed an executive order aimed at ending the controversial separation of migrant families at the border. He insisted the administration would continue to refer every person who is caught crossing illegally for prosecution. On Monday, administration officials called on Congress to provide more resources to secure the border. The reality on the border, according to one Customs and Border Protection official, is that the agency is overwhelmed. Border Patrol stations are overcrowded and kids are waiting in cagelike holding cells while their mothers and fathers go to court in shackles. The agency simply does not have the resources to enforce "zero tolerance." Federal agents also complain they're spending more time processing immigrants than guarding the border. Health and Human Services spokesman Mark Weber says the agency's main goal is family reunification and that it knows where the children's parents are. The agency operates more than 100 shelters and is facing continued criticism from parents, advocates and lawyers who say the government is not doing enough to immediately reunite the some 2,000 children still in shelters with their parents. Weber says the agency is "working as fast as we possibly can" but that the reunification process takes time because sponsors need to be vetted before children are released to them. "There's a lot of safety precautions," Weber said Monday at a border crossing in Tornillo, Texas, where the agency's newest emergency shelter is located. "We do not want to release a child too soon, too fast, because we didn't take the care to ensure that that child is going to be reunited with a parent or an appropriate loved one that the parent has designated." On average, the children spend about two months in the shelters before they are released to go live with a family member. Some are at the Tornillo shelter — a collection of about 20 sand-colored tents in the remote windblown border crossing in Tornillo, about 30 miles east of El Paso. Critics have dubbed it a "tent city." It's about 100 yards from a steel border fence and the Rio Grande beyond that. The shelter has 326 migrant kids ages 12 to 17, mostly teenage boys from Central America. Twenty-three of them were separated from their parents when they crossed the border illegally. And under the president's now suspended child separation policy when it was still in effect, they were sent here, and the parents are detained elsewhere waiting to see whether their asylum request is accepted. Since the shelter hurriedly opened 12 days ago, an official said, three of the 23 have been reunited with parents. Reporters touring the encampment were not allowed to speak with the children, who smiled and gave thumbs up when asked how they're doing. It's completely self-contained out in the Chihuahuan Desert, where afternoon temperatures soar to 103 degrees. They have large air-conditioning units next to each big, military-grade tent. There's a cooling station next to the soccer field, which is made of AstroTurf, where kids go to chug Gatorade and sit next to fans. The shelter also has its own power, water and Internet. They have the same services seen in other HHS-contracted youth shelters — 24-hour mental health and medical care, individual caseworkers, a mess hall with three hot meals a day. Also at the shelter: a phone tent with nine operators. The children are supposed to be able to call family members, either in the U.S. or abroad, to tell them where they are and try to reunite with them. The agency guarding the southwest border of the United States says it will suspend President Trump's zero tolerance policy. It will stop referring every person caught crossing the border for criminal prosecution. It was the prosecutions that led to the administration's separation of parents and children. Here's NPR's John Burnett. JOHN BURNETT, BYLINE: The commissioner of Customs and Border Protection, Kevin McAleenan, said his agents would temporarily halt sending families to court to face criminal charges for illegal entry. He said child separation just hasn't worked. KEVIN MCALEENAN: A much better system would be to keep families together through their immigration proceedings. That's what the Obama administration did in 2014. That's what the president has asked Congress to help us do now. BURNETT: McAleenan was on the border in McAllen, Texas, yesterday talking to reporters. MCALEENAN: It's a huge challenge operationally for our agents. BURNETT: A CBP official speaking on background confirmed that border patrol stations are overcrowded. Kids are waiting in cage-like holding cells while their moms and dads go to court in shackles. What's more, federal agents complain they're spending more time processing immigrants than guarding the border. Meanwhile, another government agency offered a rare look Monday to reporters of how it's caring for unaccompanied immigrant kids. U.S. Health and Human Services gave a tour of a controversial emergency shelter in west Texas, which critics call a tent city. About 330 kids, mostly teenage boys, live in air-conditioned tents, get medical and mental health services, play soccer on AstroTurf and call home. They smiled and gave thumbs up to a group of journalists trundling through their desert encampment outside of El Paso. We were not allowed to record anything or talk to the boys. On average, the children spend about two months in shelters like this before they're released to go live with a family member. And HHS spokesman Mark Weber, speaking at the sweltering border crossing where the shelter is located, says their main goal is family reunification. But they need to be careful. They have to vet the sponsor to whom they release the children. MARK WEBER: There's a lot of safety precautions. We do not want to release a child too soon, too fast because we didn't take the care to ensure that that child is going to be reunited with a parent or an appropriate loved one that the parent has designated. BURNETT: But two months is a long time to a parent who's had their child forcibly taken away by immigration agents. The family reunification process that seems so well organized during the press tour is a source of deep anguish to parents who spoke to a room packed with journalists in El Paso. BURNETT: One distraught father, who gave his name as Mario from Honduras, told of calling a 1-800 government number to try to speak to his daughter. It rang and rang, he said, with no answer. He had not spoken to his daughter during the month he was in ICE detention. BURNETT: "I'm crushed," he said. "I don't know anything about her. Today, she's 10 years old, and I can't call her and tell her how much I love her." John Burnett, NPR News, El Paso.